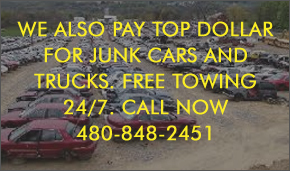 Pluck a Part is Tempe Arizona’s largest junk car buyer. We offer our customers an exceptional price for their end of life vehicle. We buy all makes & models of vehicles regardless of their year, or their condition. Selling your vehicle is easy – you contact us, we provide a quick, fair offer for your vehicle, you accept, you drive your vehicle to our nearest location (or we arrange for towing) and we pay you on the spot! Volume Junk Car Vendor Program. If you have multiple vehicles to sell then you might be a good fit for our volume junk car vendor program. We have formed strategic partnerships with hundreds of similar junk car sellers (and are always looking for more) to ensure we can constantly provide our parts customers with a large inventory of fresh vehicles to pull parts from. 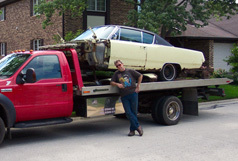 Once set up, our team of junk car buyers will call you regularly to bid on your available vehicles. To get started, please contact your local Pluck a Part store at 480-848-2451. Our consistent record of buying premium junk cars has been the hallmark from which we were founded upon. Our commitment to our clients is simple. We will always strive to provide the best possible service while providing you with an honest price for your junk car. Pluck A Part guarantees exceptional service with great prices on used auto parts. We make buying used auto parts simple. We gaurantee all used auto parts. Simply return it within 30 days for a store credit.